Explore textile techniques with metal to make jewellery from a variety of fine wires and beads. Techniques covered include knitting, crochet and French-knitting. Experiment with different colours of wire including colour-coated copper, stainless steel, soft iron wire and fine silver. 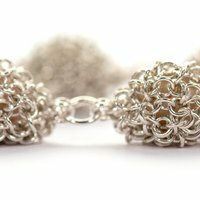 This course gives you a comprehensive introduction to making jewellery with wire and beads using textile techniques, including knitting, crochet, and French-Knitting (knitting on a spool). No previous experience is necessary - some techniques require good manual dexterity. You will have the opportunity to try all three techniques and produce a series of finished pieces including bracelets, necklaces and earrings. You will learn how to cast stitches on and cast off, how to add in beads or pearls, add stitch variations, make simple clasps, attach findings and finish off your piece professionally. Time is allowed to experiment with different kinds of wire including colour-coated copper, stainless steel, soft iron wire and silver-plated wire or Fine Silver wire - a purer form of Sterling Silver which is more suited to these textile techniques. The step-by-step project books give professional diagrams of how each project was achieved - use them to carry on making at home and to adapt to your own designs. Small class sizes allow time for individual tuition and help as necessary. Information will also be given concerning materials, suppliers and suggested further reading. You can keep items of equipment (included in the course fee), all samples made and instruction sheets so you can carry on making independently. Students should bring glasses if worn for close-up work. If you have a bead collection you may bring some with you. 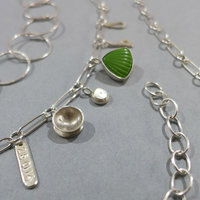 Extra wire (including Fine Silver wire) and beads are available to buy throughout the course. 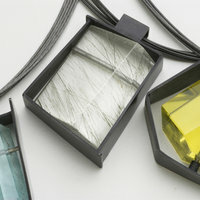 Teri Howes trained as a jeweller in 2000 at Kensington & Chelsea College going on to establish her studio at London's famous Cockpit Arts in 2005. 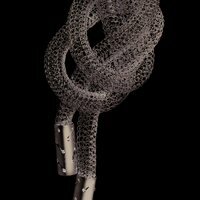 Teri's work features her now signature hand-crochet techniques in precious silver, gold and diamonds. She shows regularly at Goldsmith's Fair, and other exhibitions in the UK and internationally.